These Ampeg full revalve kits are put together to provide a sonic upgrade to your Ampeg. I own and have played over the past 30 years Ampeg SVT, Original V4B and for recording used the B15-N portaflex.These amps are still the kings of bass amplifier in my opinion and these kits use the best of New Old Stock valves and modern day production items to give you the best sound out of these lengendary bass amps. Ampeg SVT Vintage Reissue Pre amp kit is designed to give your Vintage Reissue head a clean sound but when run with a fair amount of input gain will give a little valve distortion that will recreate the edge of the original valve vintage SVT. This set will suit the player who wants to get more of a vintage throaty ampeg valve sound with plenty of punch with aggressive highs. The Harma 7025-STR DR250 is a high gain valve selected for bass amps and it will not distort as soon or sound as fizzy as the standard Chinese 12AX7-C. The Harma 7025 therefore offers better performance with this regard. The valve is very well balanced with nice even bass which has plenty of depth with the top end being more aggressive and hard. The valve when used in conjunction with the extensive tonal shaping of the Vintage reissue head can be used to get the full range of vintage punky Precision bass type clank to a more modern rounded bass sound with a harder edge. In the output stage we selected and match a sextet of JJ 6550 which I have been evaluating over recent months. The JJ 6550 provides very lively punchy performance with a silky smooth midrange. 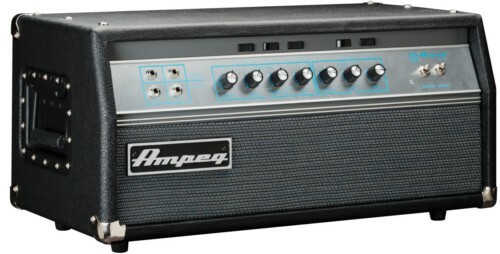 The classic ampeg growl was not as pronounced as with the GE, Svetlana or The Harma 6550. The low end bass response is very tight with plenty of depth and detail.